I find myself never using the MacBook Pro’s optical drive, the only time I have used it was to boot Mac OS from a DVD to reformat and reinstall Mac OS X. Now that it’s so easy to install Mac OS using an external drive though, is having a DVD drive really a good usage of limited hardware real estate on your MacBook/Pro? If you’re like me, you might consider repurposing the optical drive slot to accommodate another hard drive, like a really fast SSD drive. You can do this using a great product from MCE called the OptiBay, and any internal 2.5″ drive (not just SSD’s). LifeHacker just wrote up a complete walkthrough on the hardware installation process, and it’s really motivated me to do this install myself. It’s really worth mentioning that the $99 OptiBay unit comes with a caddy to turn your once internal SuperDrive DVD unit into an external DVD drive, which is a really great added bonus and allows you to still use the SuperDrive. So is this worth it? I think if you don’t use your optical superdrive, and you want more hard disk space – then absolutely yes. Plus installing an SSD on a MacBook/Pro is a really good way to boost performance, it’s a bit dated but you can see MacPerformanceGuide.com for more on SSD’s and Mac’s. I have seen the performance boosts firsthand, a friend of mine recently added a 160GB Intel X25 SSD to his MacBook Pro as the main disk and it absolutely screams. The OptiBay drive really allows for the best of both worlds: using an SSD as the main drive to run Mac OS X and apps off of, and using the OptiBay drive to put a larger standard 2.5″ disk in to use as file storage. Do I loose my warrenty if I bring that in my MacBook? Good question, I think that varies depending on what you do once inside the MacBook. This post on iFixIt suggests that the warranty is only voided if you break something and that it’s OK to replace user-servicable parts (which are usually defined as RAM, HDD, battery). The question is, would the SuperDrive be included in that user-servicable parts list? I’m not sure. If it was up to me, I’d just be very careful and if I was to return the MacBook to Apple for some reason, I’d put the stock SuperDrive back in place. No, you don’t loose your warranty. To loose your warranty would be to set it free! You will lose your warranty though. Nice… or is it niece? Please keep in mind that you can only do this with the recent macs. Older macs don’t have SATA optical drives and thus cannot use the OptiBay and many other of these kits. There are kits like the NewModeUS ones that have a PATA to SATA converter in the unit itself so you can put a SATA HDD in. Yeah, but doing that will make a SATA drive pretty much as slow as PATA. Same as hooking up a pair of high speed ethernet routers with a 56k modem bridge won’t make the data transfer rate Gigabits per second. MCE Technologies has OptiBay kits for virtually all mac makes and models, going back to the powerbook G4 line and even for iMacs and the Mac mini. Depending on the OptiBay kit you order, it will have the correct adapter for your machine. The MCE OptiBay can go into virtually any Mac, using PATA or SATA, you just need to specify which one. I used to have one in my old PBG4, now i have one in my MBP unibody, my iMac, and even my mac mini. MCE you rock! I have the MCE optibay in my 2009 MBP17… It is terrific. I chose to go with a 2nd large capacity 500GB 7200 RPM Hitachi Travelstar (7k500) instead of an SSD. I also have another Hitachi Travelstar 7k500 as my primary drive. I chose to have OSX on the primary and I made the 2nd internal 500GB drive as a bootcamp partition for windows 7. I’ve considered replaceing the primary with an SSD. I’ve been looking closely at the Mercury SSD drives. But they are still a bit out of my price range so I’m just waiting till they drop in a year or two. I know its been a long time since your post but if you are still interested their are basically two options. 1. Install windows on the drive before removing the optical drive when the hard drive is in the normal hdd spot. 2. Use an external cd drive. Beyond that it is pretty much impossible I think. My experience is trying to dual boot a MBA without using a dvd drive. Impossible as far as I could tell. Instead of an SSD you could RAID 0 your two drives so you would still have 1tb and it should be faster, especially with two 7200 drives. I’m going to do that with two 500GB 72rpm 4GbSSD hybrid’s……. BUuut im not sure if that will void my kickass best buy warranty.. you know bro? I have a friend who has had 3 x OWC SSD drives fail. I’ve gone for Intel reliability – very little price difference now. So does it void warranty or not? Warranty generally is not void for user replaceable parts. However, in the manual, Apple does not include the optical drive as such an item (eg, RAM and HDD). Should any problems arise, swap the original internals quicksmart before taking it back to Apple for a diagnosis. If you’ve damaged something in the process of the mod, warranty does not apply. Basically, warranty is implied on the original parts only. You may open up your Mac as you wish as that no longer voids warranty anymore. I’m going to get myself one of these MCE trays. Optical drives are so 1990s. I have an early 2009 Mac Mini and am about to remove the optical drive and replace it with an Optibay. Does anyone have any suggestions on where I can get a bezel or insert to fit over the newly-non-functional slot? Is it possible to setup RAID1 with the Optibay on a 17″ MBP 2009 ? Hello. So, if I purchase an optibay, and another hard drive (in this case, a 500GB) I can add this in the optical drive slot so I will have a total of 660 GB of hard drive space? (My primary drive is a 160GB) Can it recognize this much space? I heard MBP’s can only recognize 500 GB of space, or is that just for one hard drive? So, the total amount total you can have is 1TB (Two 500GB)? The operating system is what will be recognizing the memory. Not the logic board. Thus it does not matter if you have a Mbp mm im or any apple computer product for that matter. It will be recognized. With the SSD for OS in the normal HD spot this implies putting the larger HDD in the optical drive area with an Optibay…is this an issue in terms of noise/rattle? I’ve read somewhere else that you should put the SSD in the optical drive area for this reason (re rattle/noise), however that wouldn’t work then if the O/S has to be in the normal HDD area to ensure you get all features including sleep….. Anybody out there tried this with the new Early 2011 MacBook Pros? 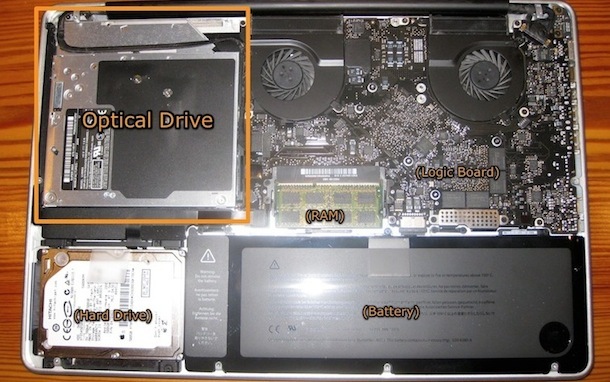 I’d love to remove the Superdrive CD/DVD and pop an SSD into it. I have a 2008 MBP with the older ATA DVD drive. My “plan” is to install a SSD in place of the DVD to run the OS and application. But, since the DVD is ATA, would I see any performance increase, might I even see a performance decrease? Another option I guess would be move the HDD to ATA put the SSD on SATA. Seems like alot of work, but might be worth the performance increase. Lots of acronyms, I know, but any thoughts on the ATA vs SATA issue? they will cover hardware – obv not optical drive. software however, you will have to put the os back on the 2.5 and then if the same problem occurs then yes software repair will be covered too.